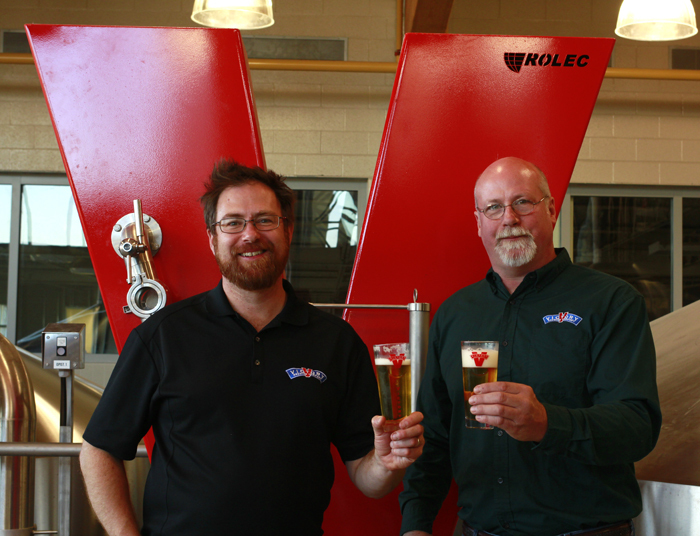 Bill Covaleski and Ron Barchet founded Victory Brewing Co. in 1996. Last year, Victory opened its second brewery in Parkesburg, PA. Photo courtesy of Victory Brewing Co.
PARKESBURG, PA—There is still a little disbelief in their voice, but it’s mostly excitement as Bill Covaleski and Ron Barchet walk around the concrete cavernous space that is their new brewery. The childhood friends, who met on a school bus in 1973 and later became the founders and owners of Pennsylvania’s Victory Brewing Co., are farther than they ever thought they’d be with their venture, which started in 1996 and produced just over 1,725 barrels of beer that first year. This is the company’s second brewery, housed in a 225,000 square-foot building that was once a Green Giant vegetables distribution center. It is located on 42 acres, about 20 minutes from Victory’s first home in Downingtown, PA. Brewing operations started last October, but the company recently began opening it up for visits from the outside, including a guided media tour last week. The $30-million project still has that new construction feel with shiny stainless steel, an automated bottling and packing line working in sync, and workers able to easily move around it all. The Parkesburg facility was a long time coming for Victory, which has been running the Downingtown brewery at full capacity, reaching 75,000 barrels annually. The addition of the second brewery will allow Victory to achieve 300,000 barrels annually, meaning more beer—like the HopDevil IPA, Storm King imperial stout, the Prima pils—will be available in more places both in bottle and draft in the 34 states (plus Washington DC) the brewery currently serves. The addition of the second brewery will allow Victory to achieve 300,000 barrels annually. Photo courtesy of Victory Brewing Co. 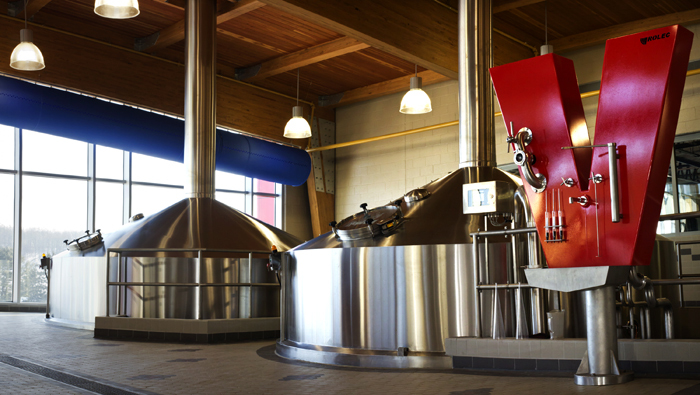 It is not uncommon for breweries these days to add second facilities to their existing operations. Sierra Nevada Brewing Co. of Chico, CA, just opened a second brewery in Mills River, NC. On that same path, Oskar Blues Brewery of Colorado also opened a second brewery in North Carolina in late 2012. New Belgium Brewing Co. of Fort Collins, CO, plans to open a second brewery in Asheville in the coming months. 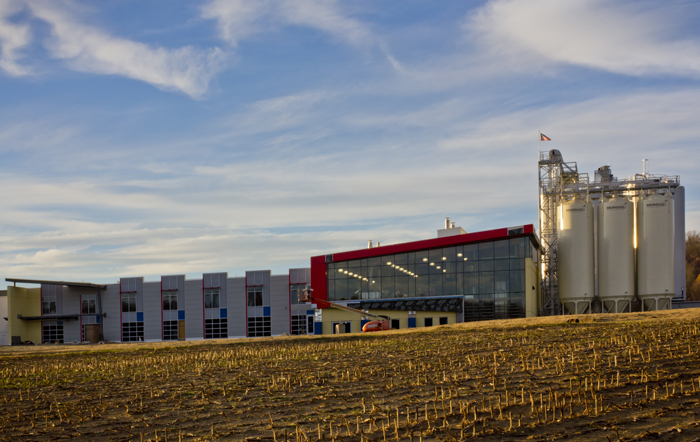 Lagunitas Brewing Co. of California just added a second brewery to its portfolio, this one in Chicago, that when running at full capacity will bring its annual production to over 1-million barrels per year. What’s interesting about the Victory expansion is that it is so close to the original location, giving Barchet, Covaleski and the rest of the staff the opportunity to stay involved day in and out. When they opened the Downingtown location (in what was once a Pepperidge Farm facility) they grew the brewery over time. New equipment was shoehorned around existing pieces. Everything works and works well, but it doesn’t have the flow some might expect. With Parkesburg, Covaleski says they were able to visualize the space and lay out a brewery that makes logistical sense. It also allowed them to install some new equipment like a yeast propagator, technology that will greatly help with the expanded capacity. “This is a huge investment, a huge leap of faith,” he said. Victory is also branching out beyond its beer offerings and making inroads in the food aisles with a number of brew-infused food products like a hot sauce made with stout and bratwursts made with IPA. There are also sauces and a ketchup, and in the Pennsylvania dairy farm tradition, beer-flavored ice creams that use the wort from the brewery, that adds a rounded sugar flavor that brings new depths to the cold sweet treat. The new brewery itself is an impressive feat. While construction continues on the planned restaurant in Parkesburg, Victory is opening the brewery for guided tours and tastings (due to space and safety issues tours have not been offered in Downingtown for the past year). Starting in early April, visitors can plunk down $58 for a tour that will leave—fittingly enough—on a school bus from Victory’s Downingtown location and travel to the new brewery. There, visitors will get to see all the bells and whistles, enjoy more than a few samples, and try food from the new Victory line. Tickets are available via the brewery’s website. Victory’s second brewery in Parkesburg is located about 20 minutes from Victory’s first home in Downingtown, PA. Photo courtesy of Victory Brewing Co. This is so sweet! I’m a huge fan of Victory beers. So glad to see them doing well and expanding and the brewery looks really GREAT!